There is much pride to be had by creating a recipe that cannot be duplicated. It is not always the ingredients that make the dish. Both the cookware used and the methods of achieving mouthwatering results are becoming lost to today’s microwave happy generation. A bag of ingredients can be purchased, poured into a bread-maker and a generic loaf of bread is born. Some shrimp can be poured into a bowl along with a foil packet of ingredients, and after being nuked in a microwave, you have something that tastes like a rubbery shrimp scampi. 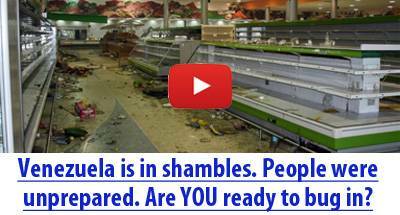 If we take away electricity, dumping stuff into a bowl or pan would be just the beginning. We need the cookware and the know-how of past generations to create home-cooked meals under rustic, or emergency conditions. Enter the Dutch oven, the preferred cookware of our ancestors and outdoor enthusiasts in the know. The most obvious reason to own a Dutch oven is the flexibility of the cookware itself. With the lid on, the vessel can be used (as its name implies) to bake everything from bread, to cakes and pies. Remove the lid and we have a sturdy pot to create soups, stews, and sauces. 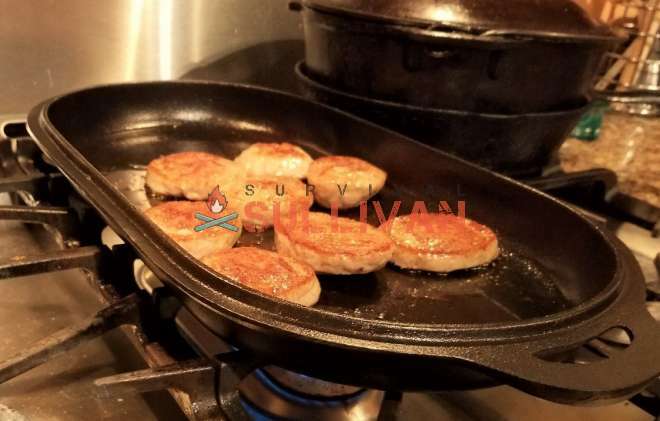 Flip the lid over and use it as a griddle for breakfast items like sausage and hotcakes (see below). Dutch ovens have different designs created to suit your intended cooking method. Many have tripod legs to elevate the oven and allow cooking over a fire or coals. These types also have rimmed lids to allow coals to be stacked on top of the oven. Some Dutch ovens have smooth bottoms and rounded tops designed to be used with modern cooktops and ovens. For our purposes, we will focus on the legged design most often associated with outdoor cooking. For some, the advantages gained by cooking with cast-iron are outweighed by the heaviness and unique properties of the cookware. Try not to fall into this group. Cast-iron heats evenly, holds heat better, and is healthier than modern cookware. Small amounts of iron are released into your food during the cooking process. This decreases the need for the intake of supplements. The roughness of the surface is created when molten metal is poured into sand molds. Over time this roughness diminishes and the surface becomes smooth and quite nonstick. 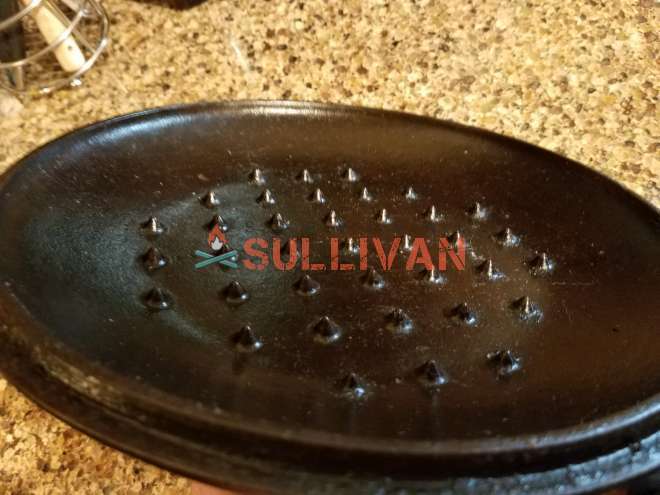 A well-seasoned piece of cast-iron releases food as well as most newfangled nonstick surfaces, plus has the advantage of heat resistance against all but smelting temperatures. If we only look at Dutch ovens with legs, there are still numerous decisions to be made. First, make sure the legs are long enough… Between one and a half inches, and 3 inches will work well. This not only allows coals underneath, but also allows ovens to be stacked, so that the coals on top of one, are the bottom coals for the next. Look for consistency. The sides and the lid should have a uniform thickness throughout. This affects not only the evenness of heat entering the oven, but ensures a good seal between the pot and lid. A 10 or 12-inch Dutch oven is a good starting point. Smaller ovens can be used for a couple of people, and larger ones for large groups. Going with a 16” Dutch oven to start can be a mistake. The weight and size of a 16 incher is impressive; it is also likely to get used less due to the hassle of transporting it. Another consideration on size is the depth. They do make deep Dutch ovens. These are fine for deep frying, or items that rise like breads, etc. Choosing a standard depth oven keeps the heat closer to the top of your food when cooking. Select from a known manufacturer. It may seem impossible to mess up when manufacturing cast iron products. Some companies still do. Stick with tried and true names like Lodge, Camp Chef, GSI, TexSport, or oldies-but-goodies like Griswold. Lid Lifter – Enables cook to remove lid without losing ashes into food. Briquette Chimney Starter – Gets coals ready for long cooking periods. Welders Glove – Cast iron gets hot, hot, hot! Rack – Keeps roasting food out of juices in bottom of oven. Small Steel Plate – Put your chimney starter on it, put your oven on it. Keeps coals off the ground, reducing fire risk, and keeping briquettes or coals from smothering out. Meat Thermometer – Takes guesswork out of not having knobs. Straw Whisk Broom – Removes ashes from lid. A plastic broom will melt to your oven. Charcoal Briquettes – If you do not have a good bed of hardwood coals to work with, charcoal briquettes are considered acceptable. Only the most hardened of cowpokes would sneer at a Dutch oven cook using charcoal. Use a chimney fire starter to get the amount you need started and glowing before using them. While most manufacturers tout a pre-seasoned finish, both new and old cast-iron Dutch ovens will benefit from additional seasoning. For new vessels, clean under hot water with a brush or sponge. For used items, a hot and soapy soak may be needed to dislodge carbon and other foreign materials. Any time a piece of cast-iron is washed it must be immediately dried and given a light coat of oil to prevent rust. To re-season cast-iron, preheat a conventional oven to 350° (please note that a large outdoor BBQ works well for this), and lightly coat all surfaces with vegetable oil, lard, or a Crisco type product. Do not use olive oil or butter as they contain proteins that can turn rancid over time. Place the cookware into the heated oven and bake it for at least an hour. Remove the Dutch oven and lid from the heat give it another light coat of oil. This can be repeated as many times as needed. The end goal is a black and shiny coating on the iron surfaces. Once again, almost anything can be cooked in a cast iron Dutch oven once it is well-seasoned. A bit of prudence is suggested until that seasoned surface is obtained. High acid items like tomato sauce or recipes with vinegar may ruin a fledgling seasoning. Recipes with milk require extra attention whether using a new non-stick pan, or cast iron. Either can be turned into a hot mess if milk is allowed to burn or boil over. Start instead with fatty items like pork sausage, hamburger, or better yet, use the Dutch oven base to deep fry a few batches of fish. The highly heated oil seeps easily into the cast iron surface. I have mentioned deep frying, and range-top cooking, but have yet to touch on the culinary preparation method where Dutch ovens go above and beyond everyday cookware. It is after all… an oven. When created, the Dutch oven was designed to produce an environment like your modern stove or conventional oven. Heat surrounds the food to bake, roast, or steam it to perfection. Modern ovens do much of the work for us. To cook using a Dutch oven, you need to remember a basic rule that has been moved to the back of our modern brains… Heat goes UP! To cook evenly, especially when roasting or baking, more heat must come from above than below. It seems counter-intuitive, but look at your conventional oven when baking or roasting. The top element or burner will be working hard as the bottom element coasts along. To provide an even 360-degree cooking environment, heat must be radiated from above. As such, more coals are needed on the lid than below your cast iron cooker. Usually about twice as many. This chart will get you close for any Dutch oven, but remember that conditions like temperature and wind will affect the amount of heat that gets to your food. Let’s go through a couple of recipes to ensure you have the basics of Dutch oven cookery well in hand. To roast a whole chicken, the best bet is probably a 12D oven. That is a deep oven with a 12-inch diameter. Rub the inside of the oven with cooking oil or lard. Place a rack or trivet in the bottom of the oven to keep the chicken from burning on the heated bottom. Place about 30 charcoal briquettes in a large chimney starter and follow manufacturer’s directions to get briquettes started. While waiting for the briquettes, we can return our attention to the chicken. Wash the chicken under cool water and pat dry with paper towels. Trussing the chicken will allow for more uniform baking. Rub the outside of the chicken with vegetable oil. Season liberally with salt, pepper, and your choice of additional spices. You could make lemon-pepper chicken, garlic chicken, or just use the salt and pepper for a roasted chicken. Place the chicken, breast down, on the rack inside the Dutch oven. Place the lid on the oven. Dump 10 or 12 coals onto a metal plate, or flat surface. Set the oven over the coals. If the coals are really warm, it may be necessary to “ring them”. In other words, just place them around the outside edges of the oven. Pour about 18 briquettes on top, and arrange them evenly. Walk away. After 30 minutes, carefully lift the lid and check the cooking process. Turn the chicken onto its back. Replace the lid, and continue cooking. Depending on the size of the chicken and outside conditions, allow about 20 minutes before checking again. Use a meat thermometer to check for doneness (Safety guidelines have been lowered to the suggested internal temperature of at least 165 degrees F. Make sure ALL the chicken is at least 165 degrees before removing from the oven.) If more browning is needed, remove oven from the bottom coals, and add everything to the top, creating a broiler effect. Once the chicken is sufficiently browned and heated, you are ready to serve. If you have a favorite recipe for corn bread, use it. If not, any corn bread mix from the store will work fine in a Dutch oven. Dutch ovens are quite forgiving when it comes to baking. Just remember that much more heat is needed from above than below. Most store mixes or home recipes are for a certain pan size. It could be 8X8 or 10X10. In most cases, a standard 10” Dutch oven works well for corn bread. Get your coals ready or use a chimney starter to fire up some charcoal briquettes. Grease or oil the inside of your oven. When starting with a dough or batter, it is easy to apply too much heat to the underside of the oven. Place the coals in a circle just under the edges of your oven. Pour in the cornbread batter. Place the lid, and put about 15 coals on top. Cornbread in a Dutch oven is much like a pancake on a griddle. You will see changes that alert you to how done the batter is. After 10 minutes, lift the entire oven and turn 90 degrees. Lift the lid and quickly asses the cooking process. Are the edges pulling away from the pan? If the edges are not too brown, that is a good sign. If the edges are getting brown, but the middle is not set at all, pull back the bottom coals a bit. Turn the lid 90 degrees from its original position and replace. Unlike many recipes, check often from that point on. Cornbread should only take 15-25 minutes from the time it is placed in the oven. When the Dutch oven is empty, place back over the heat. Once heated, pour in a small amount of water. This is basically a deglazing process, and should loosen any remaining food particles. Dump out the hot water, scrub with a brass pad if necessary and rinse. Reapply a coating of oil to all surfaces. If a bit of maintenance is needed, place back on the heat to allow the oil to heat and re-season. Never leave moisture in the Dutch oven when storing. It should be clean and oiled. A piece of crumpled newspaper will help insure moisture has a place to go. With proper care, a Dutch oven will give you, and possibly another generation, a lifetime of cooking memories. How practical would silicone be in a Dutch Oven? I am speaking of loaf and cupcake pans for breads and muffins. I eat Paleo because I can not eat gluten, so the amounts of any food I cook or bake would no be in a large.